A highway recognised by the government as a road of national significance, the Tauranga Eastern Link (TEL) is the Bay of Plenty’s largest roading project and a key strategic transport corridor for the region. Planning for the future and addressing the need to manage growth, ensure economic development and traffic safety issues for the region are key objectives for building the Tauranga Eastern Link. generate jobs and a flow-on effect into the local economy in the form of wages and salaries. The $455 million Tauranga Eastern Link project is the Bay of Plenty's largest roading project. Tauranga Eastern Link begins at Te Maunga (near Baypark Stadium) in Tauranga and follows its existing route to the Domain Road intersection with State Highway 2 at Papamoa. It then leaves the current state highway route and crosses rural land parallel to Tara Road, across Parton Road and along the sandhills to the Kaituna River at the end of Bell Road. 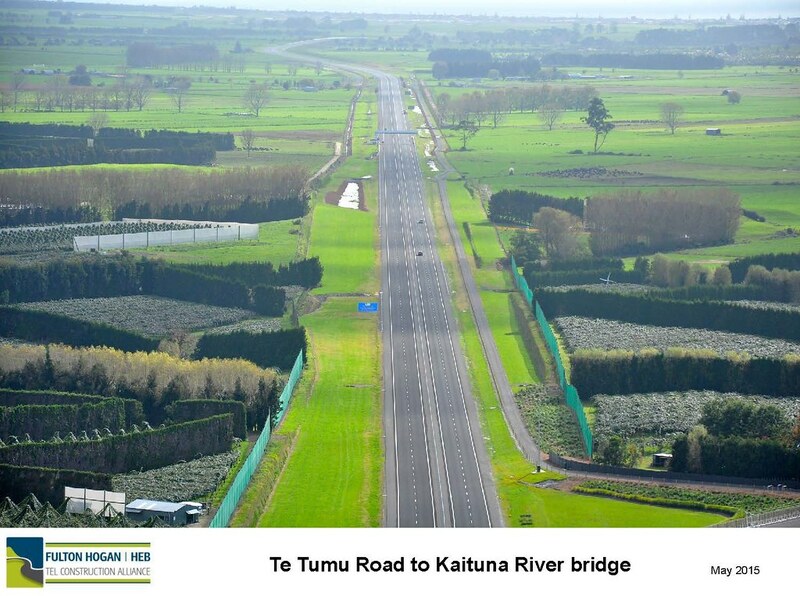 At this point the highway crosses the river and carries on past the Kaituna Wildlife Management Reserve. It heads south east across dairy farms and orchard lots before rising up over the railway line to join the existing junction of State Highways 2 and 33 (the Rotorua and Whakatane highways) near Paengaroa. provide a safer route between Tauranga and Paengaroa. One of New Zealand’s fastest growing residential areas. Population is expected to double over the next 30 years to 286,000. By 2051 Papamoa East is predicted to be a city the size of Nelson with 40,000 people and the total population of the eastern corridor itself will be upwards of 60,000. Set to become the fourth or fifth most populated region in New Zealand. As the population continues to grow, this will increase pressure on existing infrastructure. The key drivers of this growth will be increasing use of the Port of Tauranga, New Zealand’s largest port, and the development of new residential, commercial and industrial land to the east of the city. Planning for future land use and transport in the Western Bay of Plenty has been considered in an integrated manner under the SmartGrowth Strategy(external link) (external link) developed by local authorities and road controlling agencies. This strategy has a focus on corridors – known as SmartTransport Corridors. The Tauranga Eastern Link is a key priority within the development of the Eastern Corridor, and is an essential component of an integrated transport network. The urban areas within the eastern corridor, including Papamoa East, Te Puke and Rangiuru, by 2051 are expected to grow with around 60,000 new residents anticipated to move to the area. Development of the eastern corridor will support and complement the existing developing areas located south-east of Mount Maunganui. up to 100,000 square metres of shops, office and commercial activity. From a growth management and planning perspective, the Tauranga Eastern Link is integral to the development of the eastern parts of Tauranga and will form a transport network that will support and enable the anticipated growth. 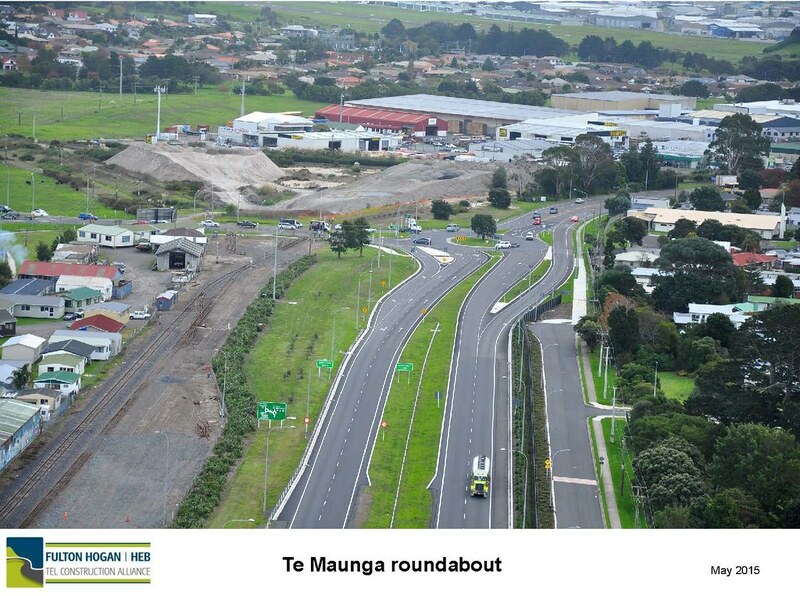 In terms of road safety the Tauranga Eastern Link will provide safer traffic flows. The section of State Highway 2 between Tauranga and Paengaroa, is the second-worst state highway under the New Zealand Road Safety Assessment Programme, based on fatalities and serious ongoing crashes per kilometre. Construction of the Tauranga Eastern Link started late 2010 and it is expected to take five to six years, depending on soil and weather conditions. The project is six months ahead of schedule and is on track to be completed by late 2015. The opening day on August 1 featured an information hub, machinery display, vintage car display, helicopter rides, and local food stalls. The TEL opened to traffic on Monday August 3. Final flyover showing completed 21km project – 15km tolled motorway and 6km expressway. The $455 million Tauranga Eastern Link project is expected to deliver significant local, regional and national benefits when it is complete. For the local community and road users, it will bring economic and social benefit. It will support planned residential, commercial, and industrial development at Te Puke, Papamoa East and Rangiuru Business Park. This enables growth and productivity gains along the eastern corridor in a sustainable and managed way, benefiting the western Bay of Plenty as a whole. Our traffic modelling tells us the Tauranga Eastern Link, once complete, may reduce the time of a return trip between Paengaroa and Te Maunga by up to 24 minutes, driving down the cost of transport. The road will be a four lane highway with a median barrier which will provide safer traffic flow, thus reducing the number of serious and fatal crashes. It is predicted to take regional traffic, particularly heavy traffic, out of main street Te Puke and Waitangi which will mean less noise and pollution and safer access for pedestrians and other users wanting to conduct their business or community activities in the main streets. The new suburb of Papamoa East will have both state highway and local road access to ensure, as far as possible, that neither option is congested with too many cars. In other words creating a balanced road network. Regionally, once complete, this project is expected to deliver several growth benefits. Contribute to a sustainable growth management strategy - to ensure that the consequences of unmanaged growth such as, unplanned infill housing, traffic congestion and in some areas, a poorer standard of living do not happen. Improve productivity for commercial transport operators – certainty of travel times is critical for business productivity and growth, and as it is a key strategic transport corridor it will help develop more efficient transport movements and enhance access for the Bay of Plenty region to Tauranga from the east (Te Puke, Whakatane, Kawerau, Opotiki, Gisborne) and south (Rotorua, Taupo). This is a key route for trucks servicing the Port of Tauranga. Reduce congestion in key areas to help enable future growth – by providing a safer and more direct route for vehicles travelling between Tauranga and Paengaroa. Currently, 21,000 vehicles use State Highway 2 each day between Te Maunga and Te Puke. National freight networks could result in increased productivity as the Tauranga Eastern Link will enable more efficient transport movements from southern and eastern Bay of Plenty to the Port of Tauranga. During 2009, public were consulted on whether they supported Tauranga Eastern Link being a toll road so construction could start up to ten years earlier. Tolling received significant community support (92% both conditional and unconditional) and as a result, NZTA submitted a tolling proposal to Cabinet. In July 2010 Cabinet approved the route could be tolled and construction has started. What's the benefit of tolling for this project? The benefit of the tolling is that it allows us to bring construction forward so it can start in 2011. Without tolling construction would most likely start in five to 10 years time. Will the whole road be tolled? No, the section from Te Maunga to Domain Road will be an upgrade of the existing two-lane road to a four-lane highway and will not be tolled. The new section from Domain Road intersection to Paengaroa will be tolled. What does the toll pay for? The toll will help pay for the new section of the Eastern Link that starts at Domain Road, Papamoa and finishes at Paengaroa. It is envisaged that at opening, the toll would be a maximum of $2 for cars, motorcycles and light vehicles and $5 for larger vehicles and trucks (all at 2008 dollars subject to inflation until opening). Will the toll increase over time? The toll charge will be increased at the rate of inflation (CPI) using a base date of 2008 dollars. How long will the road be tolled? The toll needs to raise enough money to repay the debt and interest charges. As soon as these are repaid, the tolls will be removed. This is anticipated to be a maximum of 35 years after opening. How will the toll be collected? In January 2009 the NZTA opened its first fully electronic toll collection system on the Northern Gateway toll road north of Auckland. We propose using a similar system on the Eastern Link. As collection methods and technology are always evolving, a final evaluation of the system will be made closer to the road opening. Where is the toll gantry? The toll collection point will be between the proposed Papamoa East interchange and the future Rangiuru Business Park. Will there be toll booths for us to stop and pay tolls? It provides the easiest, most convenient and greatest time savings for customers and is consistent with the convenience and time saving benefits that the road itself provides. There are environmental and safety benefits of free-flow traffic compared with requiring traffic to stop to pay at toll at a booth. Internationally, the trend is to move to free-flow electronic collection and centralised collection processes. A centrally managed electronic collection system allows the greatest opportunity for capital investment and fixed operation costs to be spread over more projects. Our focus is to continue improving the toll payment options to make paying a toll easy. Details of the toll collection system and payment methods will be available closer to opening. What if I don't want to pay a toll? A free alternative route must be available for those road users who do not wish to pay a toll. The existing state highway route through Te Puke would be the non-tolled free alternative. 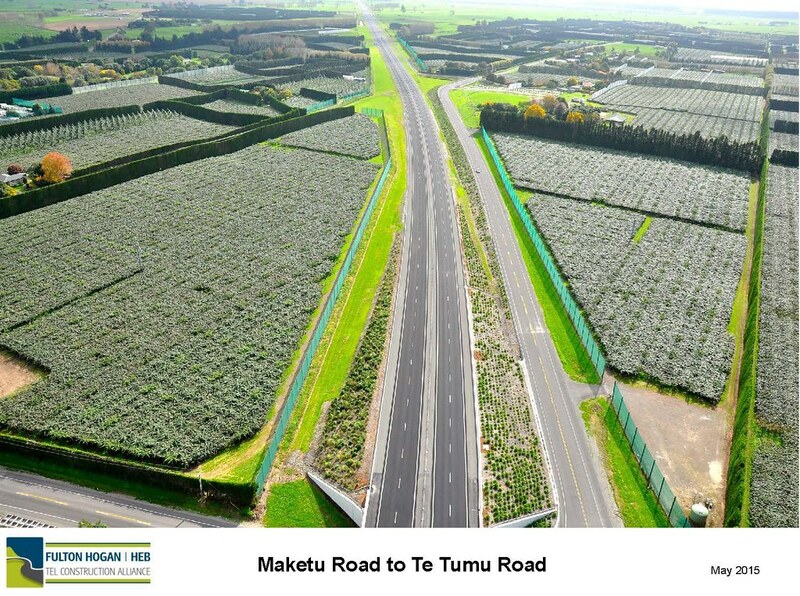 Building a new road, especially one as big as the Tauranga Eastern Link, will always impact on the environment. So the Transport Agency will work together with the contractor to minimise this impact. 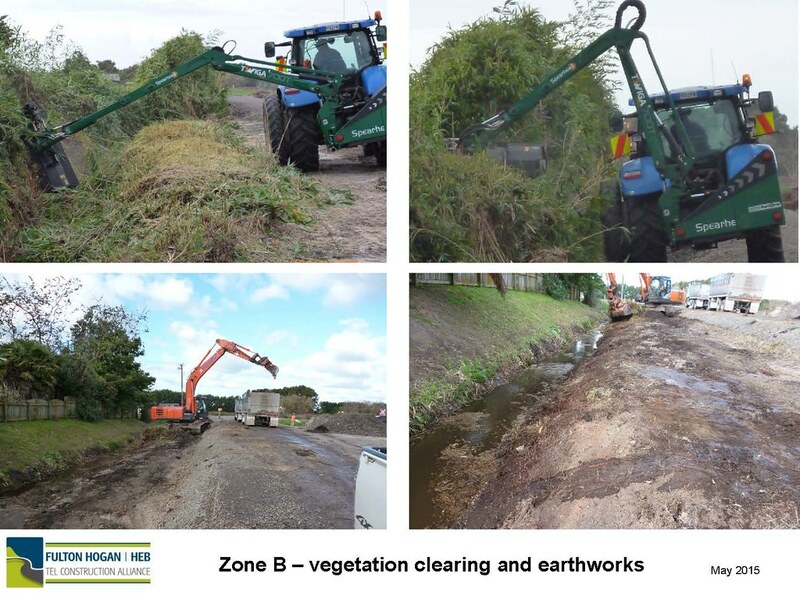 Protection of the Kaituna Wildlife Reserve ecological area, measures such as; ground water monitoring, road stormwater isolation, bird count and habitat survey prior to construction and Kahikatea dominated vegetation on the sound bund. Replanting of the Northern Oxbow by the Kaituna River. Construction management plans for stormwater, sediment, traffic and noise. Low-noise road surfacing in sensitive areas. Noise barriers and fencing for recreational areas. For the safety of motorists and construction workers, changes to traffic conditions may be required during construction of the Tauranga Eastern Link when working on or near the local roads and State Highway 2. The Transport Agency and Fulton Hogan-HEB Construction Alliance will be working hard to minimise any disruption. To receive traffic updates by email please join our mailing list(external link). To allow final road surfacing to be completed, the Tauranga-bound slip-lane will be closed. All traffic will be diverted via the SH2/Domain Road roundabout. To allow final road surfacing to be undertaken, a manual stop/go along with a 30km/h temporary speed restriction will be in place.